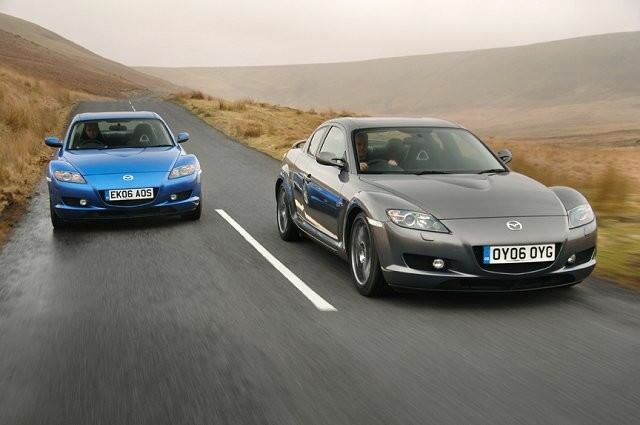 Mazda introduced the RX-8 in 2003 with a Wankel rotary engine and with a pair of supplementary rear-hinged doors to provide access to the back seats. Never a firm to follow convention, Mazda introduced the RX-8 in 2003 with a Wankel rotary engine and with a pair of supplementary rear-hinged doors to provide access to the back seats. A success in spite - or perhaps because - of its different approach the RX-8’s long production run means there’s a sizeable number of used examples to choose from - at prices to suit almost every budget. There might be a few around, but the RX-8 is a fairly specialist machine that requires a clued-up owner who’s prepared to look after it. The unique Wankel rotary engine uses a lot of oil, so be sure to check that any previous owner has kept an eye on levels and filled it up regularly. Find a good one and you’ll have an engaging, enjoyable rear-wheel drive coupé, which, thanks to those small additional rear doors and relatively spacious rear seats could be used as occasional family transport. Through its production cycle the only really significant changes came in 2008, when the first generation model was improved with mildly revised styling, some structural stiffening, suspension changes, improved gear ratios and an additional oil circulation pump. Power outputs for the 2008 onwards cars are 231hp or 215hp for the optional automatic. Earlier cars come in two power outputs, either the 192- or 231hp (many classified ads containing figures close to these numbers depending on the conversion from PS, hp or bhp). The lower output model came with either a five-speed manual or four-speed automatic gearbox and the higher power car gained an extra gear and no automatic option. In all versions performance is brisk, the manically high-revving engine achieving a 0-100km/h time of 7.2 seconds in the lower powered model, or 6.4 seconds in the higher power car. Trim levels through its production run included Sport, Touring, Comfort and a few special editions, though all came with air conditioning, alloy wheels and CD player. The used selection in Ireland runs out around 2008 - newer cars are extremely rare. Best choice then is the 231hp model, the greater power making better use of the RX-8’s 50/50 weight distribution and fine on-road balance. There’s little economic benefit to buying the lower output car, as both feature real-world fuel consumption that can safely be categorised as 'scary'. The RX-8 is a specialist car that’s surprisingly useful, though needs plenty of care to keep working at its best. A fairly specialised machine that isn’t without appeal, but it’s definitely a case of buy informed, the RX-8’s quirks are a huge part of its draw, but also demand knowledgeable, enthusiastic owners. If that sounds like too much trouble then look elsewhere, though if you’re prepared to put in the effort the RX-8 is a very rewarding and highly enjoyable sports car.